On the same day he was named a McDonald’s All-American, Precious Achiuwa hosted several big-time visitors at Montverde (FL) Academy. North Carolina coach Roy Williams and Kansas coach Bill Self trekked to the Florida school to watch the 6-foot-9 wing, who on Thursday was one of six New York/New Jersey guys named a McDonald’s All-American. 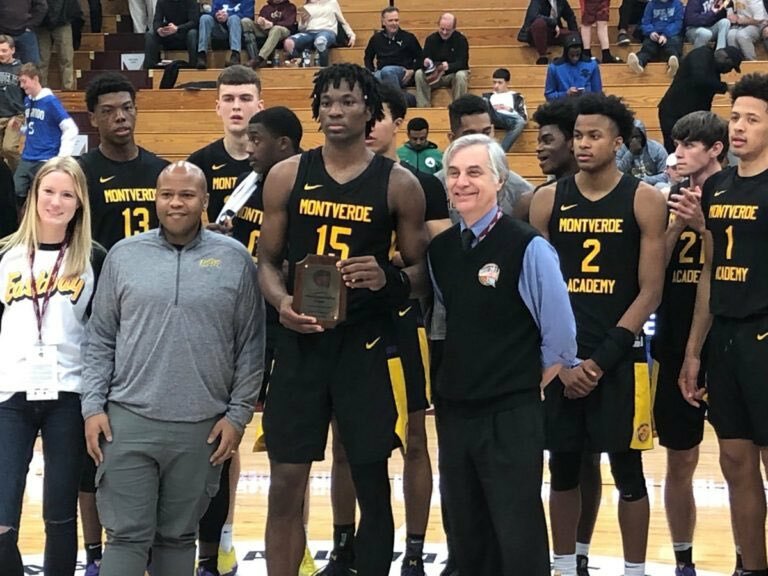 Achiuwa went for 22 points and 12 rebounds in Montverde’s win over Westminster Academy. UConn head coach Dan Hurley and assistants Kimani Young and Tom Moore saw Achiuwa Monday at the Hoophall Classic. Achiuwa, the younger brother of former St. John’s forward God’sgift Achiuwa, has yet to take any official visits and is aking his time with recruiting. He discussed his recruitment in depth at the Hoophall. UNC coach Roy Williams, seen here chatting with Kevin Boyle, saw 2019 @PreciousAchiuwa on Thursday at @MVABasketball.